Fantastic Value of Avios in Brazil. Oh, and I Am Going to the World Cup. 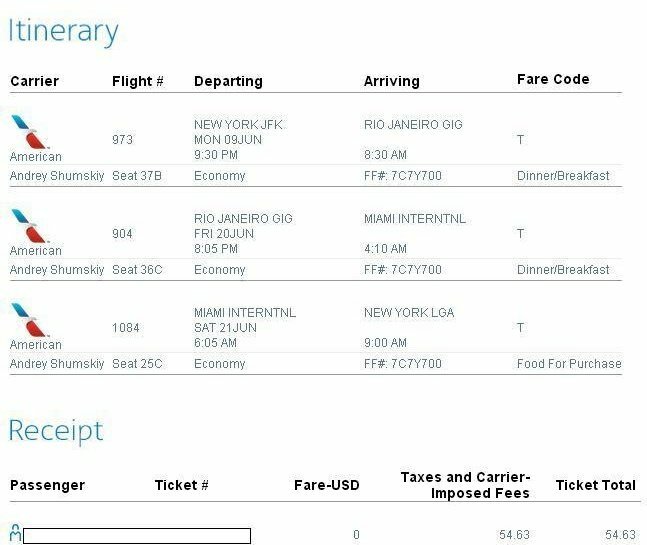 OK, I have finally booked two AA award tickets to Rio for my cousin Timmy and me. Haven’t gotten game tickets yet, or a roof over our heads. That’s fine. We’ll just wing it. We’ve done it before. For those of you, folks, who don’t know yet, AA opened up a lot of Saver inventory from most of the US cities to Brazil during the World Cup. I wrote about it yesterday in my post appropriately named Massive AA & Azul Award Availability to World Cup in Brazil. After I researched the availability on Azul — the newest Star Alliance partner meant to replace Brazilian giant TAM that defected to One World — I got curious as to what’s up with TAM. In the end, we know one little, obscure One World Airline program that would be absolutely awesome to use on short hops between Brazilian World Cup cities. So I fired up British Airlines award engine (although the words fire up don’t do justice to that tooth-pulling, ice-age mechanism) and started performing some searches. Do yourself a favor, fellows, and use Quantas, unless you have some serious time on your hands. To my delight, I found some decent availability and fantastic value. Of course, as we know, the best way to use Avios is to burn them on direct short hops. 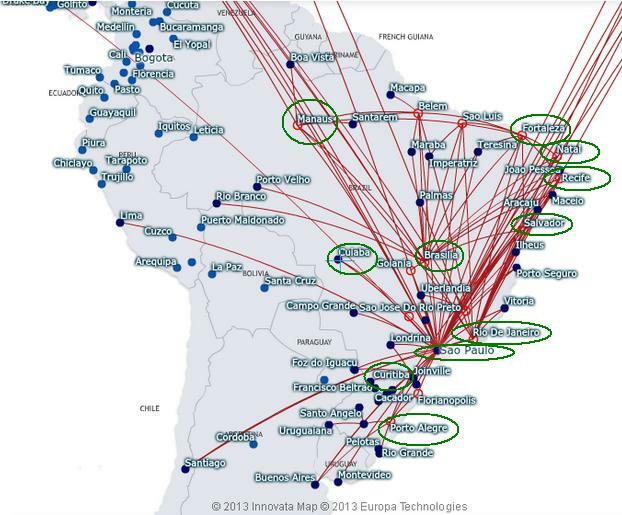 Here are TAM major and minor hubs in Brazil among the World Cup cities. What you need to remember when you search your flight is that you have to check both airports in cities like Sao Paulo and Rio. For example, when you’re searching Sao Paulo, always try both GRU and CGH, and when you are looking for flights from or to Rio, always try both GIG and SDU. Don’t expect BA.com to find the right airport for you. Here are sample one-way Avios redemptions on TAM. Of course, the beauty of using an airline with so many mini-hubs is that you don’t have to route all your flights via Rio or Sao Paulo. A non-stop flight between Brasilia and Recife is only 7,500 miles. Check the map, and call British Airways if your desired route doesn’t show direct availalbility when it’s supposed to be there. It might be that the website doesn’t see it. Well, that’s it, folks. Questions? Tips? Post them here.